Social Control Through Law is remarkable in manner and style. Roscoe Pound shows himself to be a jurist, philosopher, and scientist. For Pound, the subject matter of law involves examining manifestations of human nature which require social control to assert or realize individual expectations. Pound formulates a list of social-ethical principles, with a three-fold purpose. First, they are meant to identify and explain human claims, demands, or interests of a given social order. Second, they express what the majority of individuals in a given society want the law to do. Third, they are meant to guide the courts in applying the law. Pound distinguishes between individual interests, public interests, and social interests. He warns that these three types of interests are overlapping and interdependent and that most claims, demands, and desires can be placed in all three categories. Pound's theory of social interests is crucial to his thinking about law and lies at the conceptual core of sociological jurisprudence. Pound explains that rights unlike interests, are plagued with a multiplicity of meanings. He rejects the idea of rights as being natural or inalienable, and argues that to the contrary, interests are natural. The contemporary significance of the book is aptly demonstrated by the skyrocketing rate of litigation in our postmodern society. As the influence of familial and religious institutions declines, the courts exert an unprecedented degree of control over the public and private lives of most Americans. Law is now the paramount agency of social control. 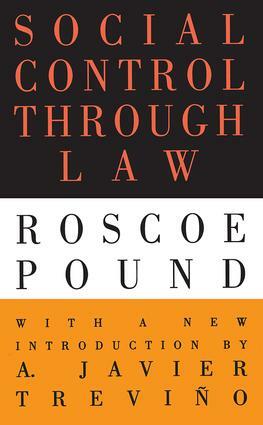 In the new introduction, A. Javier TreviNo outlines the principal aspects of Roscoe Pound's legal philosophy as it is conveyed in several of his books, articles, and addresses, and shows their relationship to Social Control Through Law. This book is an insightful, concise summary of Pound's ideas that, after more than half a century, remains surprisingly fresh and relevant. It will doubtlessly continue to engage jurists, legal theorists, and sociologists for many years to come.